The pair of them, horseshoe-bat and board-comber, exist in the attic for one purpose: to collect things. They comb the boards like shell-gatherers comb beaches, but not for shells of course. Not this board-comber at least. 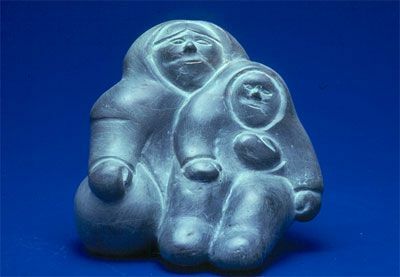 It is interested solely in soapstone carvings made by the Inuit Eskimos. That’s his bag. That’s what he seeks. Others might collect paintings, or toy cars, or books, or porcelain figurines. This one scours the tideless reaches of the attic for Inuit carvings. …..
Marbled Green Serpentine and 3.75" tusks. Mathew carved realistic ripples in this marbled soapstone creating a magnificent visial and tactile effect. The Canadian Arctic has been populated for more than 4,000 years. The first inhabitants can be traced back to Siberia, where they crossed over the Bering Strait and then migrated across Canada's Arctic as far east as Greenland, and as far South as Newfoundland. Remnants of this culture mostly consist of superbly fashioned small tools and weapons. Only a few of the preserved artifacts carved in ivory could be considered works of art. 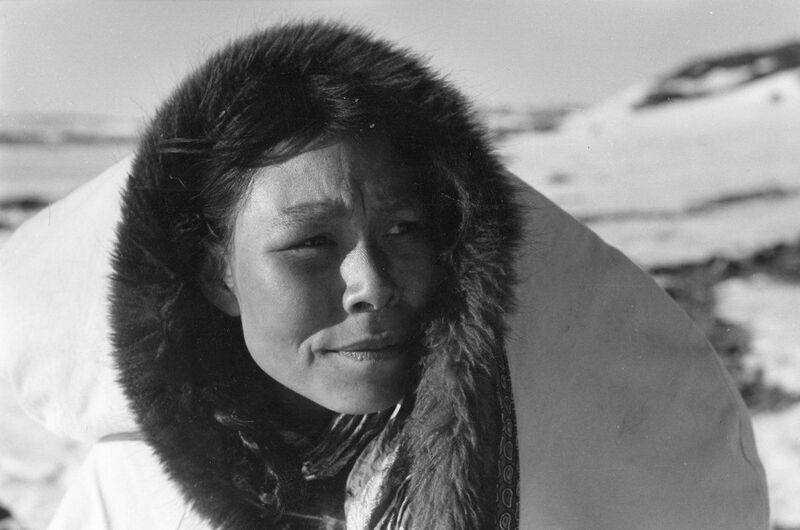 Among the descendants of Paleo-Eskimo people, a new culture started emerging around 800 B.C. The Dorset culture, as it is now called, produced a significant amount of figurative art between c. 600 B.C. to 1000 A.D. The Dorsets utilized ivory, bone, antler, and occasionally stone, to create small-scale birds, bears, walruses, seals, and human figures, as well as masks. These items had a magical or religious significance, and were either worn as amulets to ward off evil spirits, or used in shamanic rituals. Around 1,000 A.D., the people of the Thule culture who were ancestors of today's Inuit, migrated from northern Alaska and either displaced or slaughtered the earlier Dorset inhabitants. Thule art differed from the Dorset culture art in that it had a definite Alaskan influence, and included utilitarian objects such as combs, buttons, needle cases, cooking pots, ornate spears and harpoons. The graphic decorations incised on them were purely ornamental, bearing no religious significance. The main purpose of this art was not to appease spirits or the forces of nature, but to make the objects used in everyday life appealing. In the 16th century, contact with the white man began. Inuit began to barter with whalers, missionaries and other visitors to the north for tea, weapons or alcohol. Carvings of animals, hunting or camping scenes, usually made out of ivory, became common trade goods. Inuit artists also began producing ivory miniatures to be later used to decorate European rifles, tools, boats, and musical instruments. 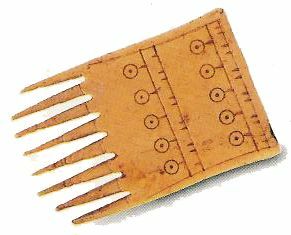 Cribbage boards and carved walrus tusks were intended for the whalers. Missionaries, on the other hand, encouraged the introduction of Christian imagery. Since the Inuit lived off the land, all of their utensils, tools and weapons were made by hand from natural materials: stone, bone, ivory, antler, and animal hides. A nomadic people could take very little else with them besides the tools of their daily living; however, other non-utilitarian objects were also carved in miniature so that they could be carried around or worn, such as delicate earrings, dance masks, amulets, fetish figures, and intricate combs and figures which were used to tell legends and objectify their oral history and deeply held beliefs. It was, therefore, a natural progression to begin increasing the size of the ornate sculptures made out of stone, bone, antler and ivory. As the Inuit settled into communities in the late 1940s, their carvings became larger, and the requests to produce them as artwork increased. 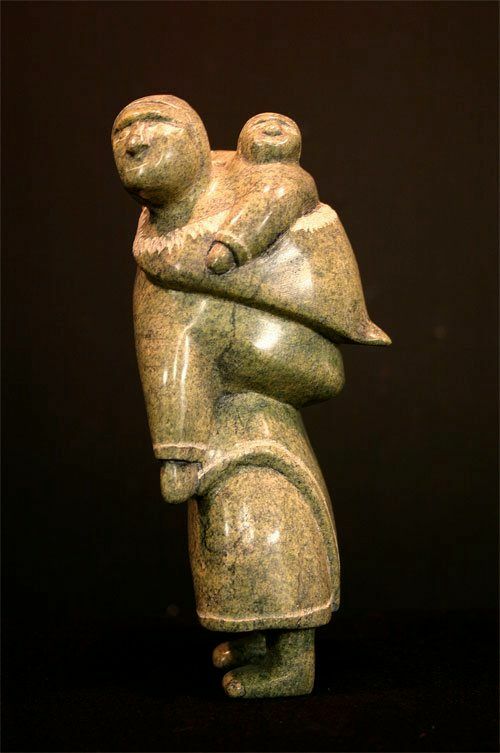 At that time, the Canadian Federal Government recognized the potential economic benefit of commercial carving to the Inuit, and actively encouraged the development and promotion of Inuit sculpture. In the new wave of artistic production, Inuit artists expanded the subject matter. Instead of utilitarian objects and games, the popular themes became figures of animals and hunters, family scenes, as well as mythological imagery. 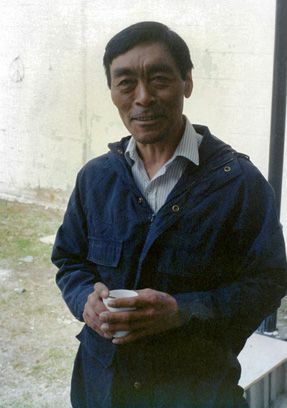 By the 1960s, co-operatives were set up in most Inuit communities, and the Inuit art market began to flourish. 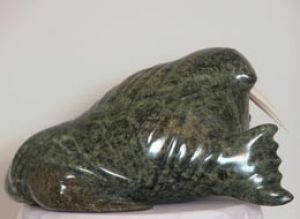 As well as providing much-needed income in isolated Arctic communities, Inuit sculpture has achieved an international reputation as a major contemporary art form. In traditional Inuit culture, a person, upon meeting a stranger, would ask "Are you a spirit or a human?" Drawing inspiration from their cultural heritage in which shamanism, spirits, myths and legends guided their existence, Inuit artists also depict intriguing and imaginative mythological creatures, often revealing their innermost feelings and beliefs. Spirits were thought to be everywhere and guided people’s existence through time immemorial. Every object, thing, and place – whether living or inanimate – possessed an inua, a soul. 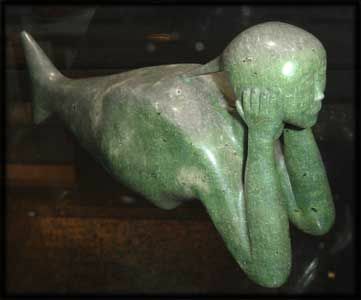 Sedna, the sea goddess, Sila, the weather spirit of the earth, Anirniq, the spirit of breath and soul, and Tuniq, the legendary giants, were some of the spirits who inhabited the Inuit world. Today, many artists still give expression to the old belief system, inspired by spirits and their intermediary, angakoq, the Inuit shaman. If hunting was poor or a person was ill, the Inuit depended on his magical skills to perform special rituals. With the help of his personal spirits and the rhythmic beat of his drum, angakoq would "travel" all the way to the moon or down to the bottom of the sea to appease Sedna in order to restore equilibrium and harmony. In two and three dimensions, Inuit artists today often depict drumming angakoqs, swimming sednas, and intriguing animal spirits – revealing a culture still rich in old legends, myths, and spiritualism. The stone most commonly used for carving throughout the Arctic is often described as soapstone or carvingstone. 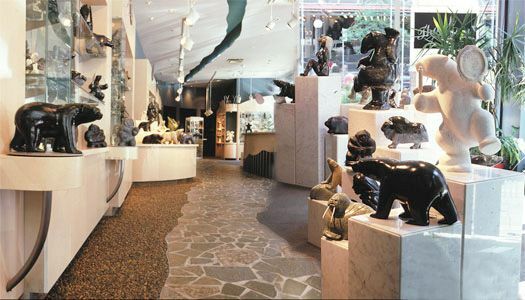 In reality, a wide variety of stone types is used, from the finely-grained or striated sedimentary rock typical of Sanikiluaq and Arctic Bay, to the beautiful volcanic rock or altered serpentine, in shades of green, found near Cape Dorset, Kimmirut and Iqaluit. The carvers use local stone and a number of artists take great pride in their personal and often secret stone quarries. In some cases major expeditions are carried out by a whole community, involving long trips over land or by sea to transport the stone after the arduous task of bringing it out from under the permafrost. 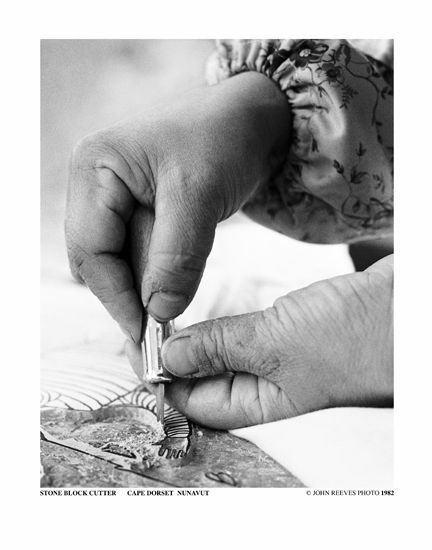 As their fathers before them, the Inuit today continue to make pieces entirely by hand. Although power tools are certainly available to them, most artists prefer to use just an axe and file as this gives them more control over the stone. It is with these simple tools that the artist sets free the spirit of the animal contained within the block of stone. The final stage of carving is the polishing, which is done with several grades of waterproof sandpaper, and hours and hours of rubbing. A final polish of oil or wax gives the carving its beautiful luster. Most interesting background on the Inuits and their carving. I have never seen one up close - only in pictures. The carvings are so beautiful in such a simple style. P. S. fansmom - I think today I can say "I am a Human" ! The art reminds me of early American Indian art but their artic home makes the subjects a bit different. Walrus and bears instead of buffalo. Probably made from the same type of materials . Very interesting. I still don't have my book yet but I see a theme here of a lot of collectable things in that attic. I don't have the book yet either, gemini, and I was thinking the same thing--sounds really interesting including all the elements in these tidbits! Maybe I'll stop by the library tomorrow, and encourage them in the search! Glad we are piquing your interest! That explains it, then - it seemed like such an odd thing for the board comber to collect. But then, a collection of unusual items is more interesting. Interesting! I really like them too. I could see myself collecting them too, if I could afford it. I'm loving all of these little tidbits you're sharing, Garry. In case y'all are wondering, we will be asking a question about collecting stuff in a few days. Liz wrote: Interesting! I really like them too. I could see myself collecting them too, if I could afford it. I'm loving all of these little tidbits you're sharing, Garry. Oh, good. I love collecting stuff...nothing nearly as nice as Inuit carvings. Just stuff!